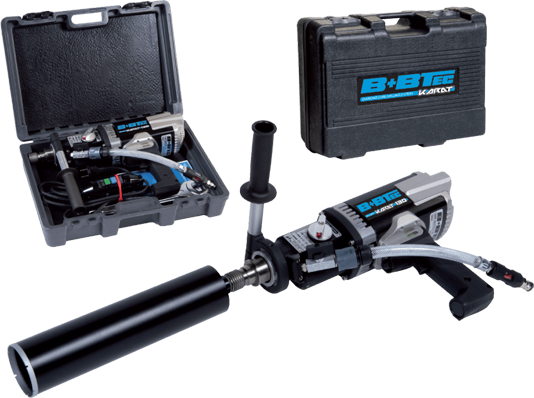 B+BTec introduce a complete new line of drilling systems, anchoring and saws. 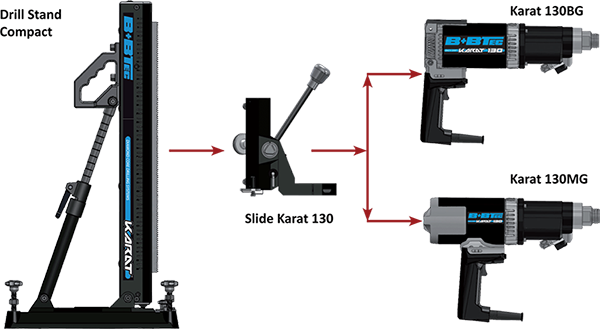 These machines are entirely designed, manufactured and assembled in our production facilities in the Netherlands and packed with new quality features. The B+BTec R&D Division has developed a wide range of Bonds (the metal in which the diamond crystals are sintered) that are engineered for optimal cutting performance and blade life in Concrete, Brick, Masonry and Porotherm Brick & Blocks and are specially designed for today’s construction materials that, due to their configuration or size, are difficult or impossible to cut using traditional methods. 5. Mid- or Back Grip Model.Back Grip best suited for Vertical Holes. Mid Grip Model for Horizontal Holes. 8. 3-Speed Gearing for optimal drilling Performance at any Diameter. 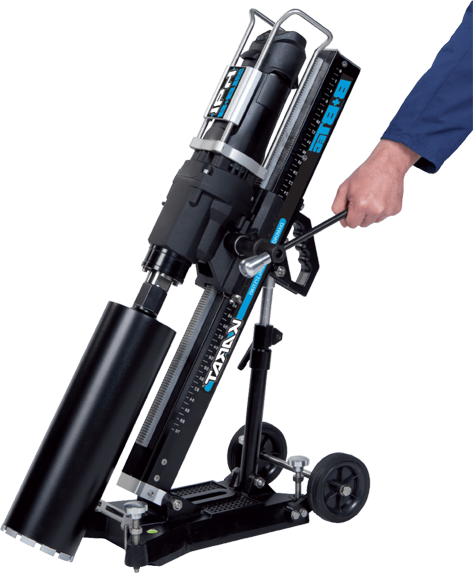 - One machine for Wet or Dry* Coring. 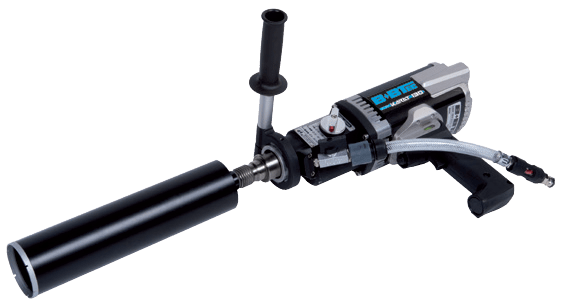 - Can be used on Drill Stand*. 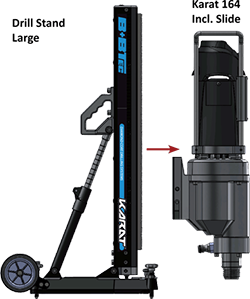 Transform the Karat 130-BG or 130-MG into a Dry Drilling Unit. Allows for Continued, Alternating Wet and Dry use. Additional Coated Aluminum Back Grip. For Karat 130-BG only. 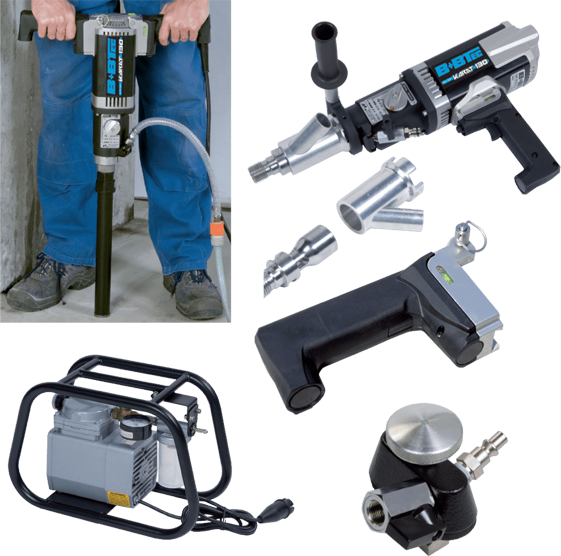 For greater operator comfort and precision when hand drilling vertical holes. Reversible Downfeed Spindle (Left - Right). - With Centering Device and Drilling Depth Indication. - LED Overload Protection System. - For Anchor and Conduit holes up to Ø164 mm. - For Conduit holes up to Ø300 mm. 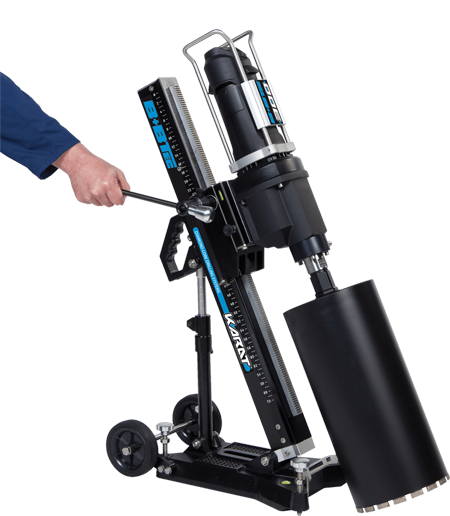 A- Karat 130BG: Powerful 2.000W Handheld Diamond Core Drilling Unit. Aluminum Motor Housing. 3-Speed Gearing. 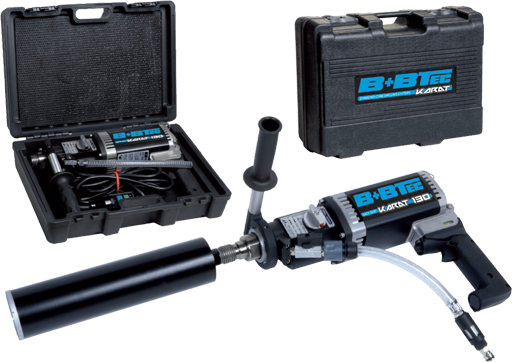 B- Karat 130MG: Powerful 2.000W Handheld Diamond Core Drilling Unit. Aluminum Motor Housing. 3-Speed Gearing. C- Karat 164: Motor/Gearbox/Slide, complete. 2.000W for Bit Range Ø10 - Ø164 mm. D- Karat 300: Powerful 2.400 W Drill Motor complete with 3-Speed Gearbox and Quick Release Slide. Supplied with Tool Set and Adapter for 1/2” Bits. Bit Range Ø25 - Ø300 mm. 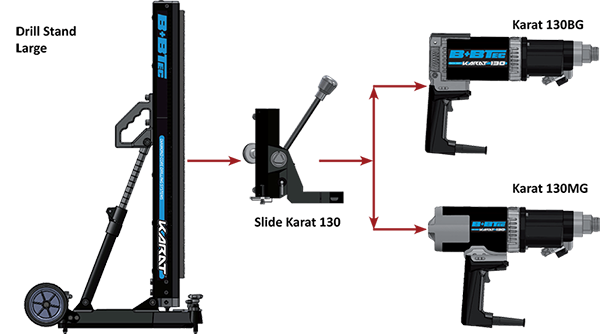 E- Slide Karat 130: For Karat 130BG and Karat 130MG Drill Motors. Fits on Drill Stand Compact and Large. F- Quick Release Slide Karat 300. For Karat 300 Drill Motors. Fits Drill Stand Large. 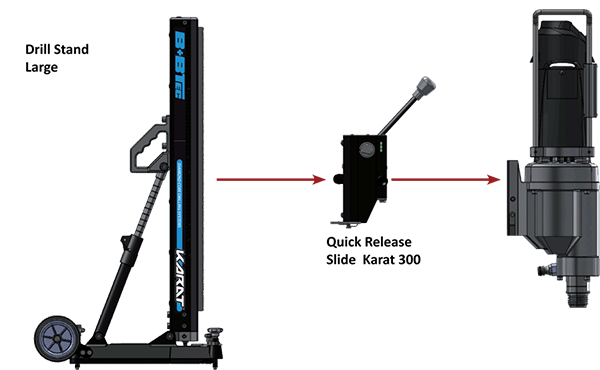 G- Drill Stand Large with Wheels: Equipped with Dovetail Guide-Way, Centering Device, Drilling Depth Indication and Transportation Wheels. Supplied with Anchoring Assembly. Weight: 13.9 kg. For Karat 130, 164 or 300 Drill Motors. H- Drill Stand Large with Wheels, stroke 1.000 mm Same as above but with longer column. Weight: 16.5 kg. For Karat 164 or Karat 300 Drill Motors. 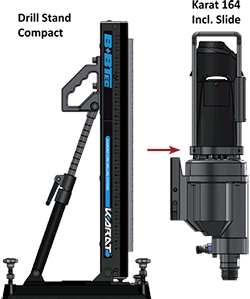 I- Drill Stand Compact: Equipped with Dovetail Guide-Way, Centering Device, Drilling Depth Indication, Supplied with Anchoring Assembly. Weight: 9.5 kg. For Karat 130 (requires slide 2.000.138) or Karat 164 Drill Motors.